But being based on the comics, the world is as weird as it is vast and with comic book movies being where the money is, there are only so many movies that are going to be released that bring the modern day mythological characters down to earth while looking up to the stars seems like the next step. From the pages of Marvel comes the story of the ultimate band of misfits in space; from the only human on the team Star-Lord to the talking, massive gun-wielding Rocket Raccoon. When an ancient power is unleashed on the universe, this group of selfish wackos are either going to continue in their greedy ways and leave the universe to ruin…or stick together for once and do something good for the rest of us. Is “Ronan the Accuser” good or bad? If you said “bad,” was it out loud, in a room, by yourself? 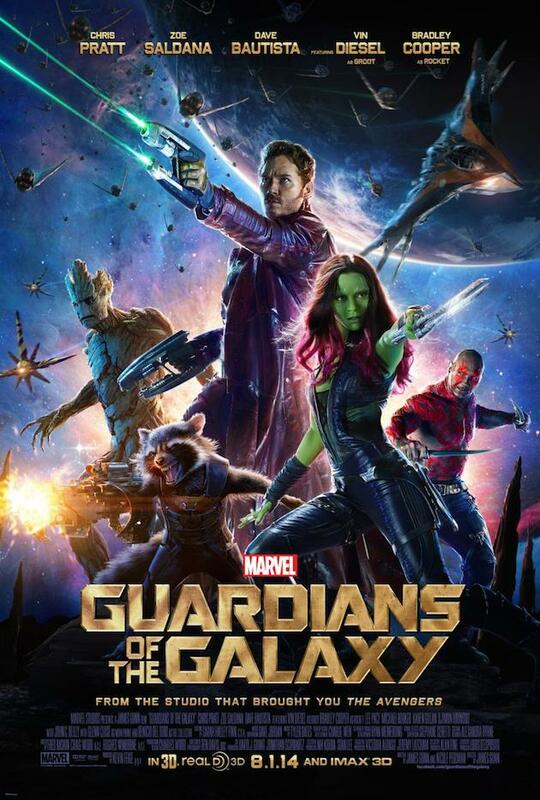 Of all the Marvel Studios movies, we’ve definitely gotten the funniest one with Guardians. Aside from the characters being what they are, the dialogue and banter is there to constantly let you know that they know what kind of movie it is they’ve made. Director/co-writer James Gunn is familiar enough with the world he’s been introduced to that only making jokes is a pretty stale way to deal with this world, while treating it like it’ Gone with the Wind just ain’t the way to go. But is funny enough? Well, the great thing about Guardians is that as funny as it is, the best part about the movie are the characters themselves. While the story is there, you’ve seen it before. Ooh, a villain wants to do villainous things and needs this object to do it. Race to get the object, get it, heroes have to get it back. There’s nothing new in that sense, but how the story, characters and other specifics are dealt with are what make Guardians unique and enjoyable in their own right. Chris Pratt as our lead is as great in the shoes of Peter Quill, aka Star-Lord, as Robert Downey Jr. is the mechanized boots of Tony Stark. Pratt’s ability to bounce back and forth between carefree and jerkish to weighty and ponderous feels balanced;appropriate. Without directly insulting Ryan Reynolds, who previously seemed to hold the title of “Go-to Superhero Guy” could have fit the part on his own terms but there’s something about Pratt that just makes you think that, given the right equipment, you could be that guy. And it’s that relatability that gives Quill, Drax the Destroyer (Oh, yeah) and the others a permanent place in the Sci-fi film world. Be it tree bark for a body or green skin, all of the characters are written as their own individuals rather than placed to build up our leading man. All in all, we’ve got a script that holds up despite whatever plot points you recognize. That and the fact that everybody speaks English, but hey, who knows how things work on the other end of the galaxy? But when you’ve got characters like Drax the Destroyer, you forget about the “little things” and breathing in space can seem normal. Positives: Pratt is great/fitting, unique characters that have been cast appropriately, good soundtrack, comic fans get their due with this, entertaining from beginning to end. Negatives: Seen-it-before plot, Bautista’s acting isn’t the best, some may have a hard time getting into such a bizarre universe. Sidenote: Of COURSE there’s something at the very end, though it doesn’t hint at the next Marvel Studios movie as much as it is unpredictable in content. This entry was posted on 08/01/2014 at 4:33 am and is filed under Reviews! with tags chris pratt, comic book movies, guardians of the galaxy, marvel, movie review, zoe saldana. You can follow any responses to this entry through the RSS 2.0 feed. You can leave a response, or trackback from your own site.